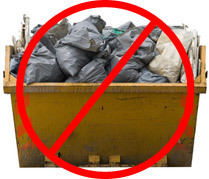 Many who call us assume that you can only get hold of a skip through a builder if you are having work done on your home – this simply isn’t true! Anybody can hire a skip, for any reason. Many of our customers are clearing out garages or attics and have too much to recycle or take to the local refuse park alone. We can help with skip permits if you don’t have a drive way or a front garden. Honestly, leave it to us and we will come up with a package that suits you perfectly. We soon realised that traditional skip hire was not the perfect solution for every customer in East Ham. This is why we introduced our manned waste removal trucks. Over the years they have become a very popular option amongst our customers. Both traditional skip hire and our manned waste removal teams have great benefits. With our waste removal teams you will not need to lift a finger, which is particularly helpful to our less able customers. Simply point out what needs removing and we will do the heavy lifting. After tidying up after ourselves you will be free of the waste that has been cluttering up your home. You don’t need the hassle of getting quotes from other providers or waiting ages for a skip to be delivered. With our help, you can be rid of the clutter that very same day if it suits you. At Away With It, we work from 7am to 11.30pm, 7 days a week. All it takes is one phone call and a no obligation same-day quote to get the ball rolling. At Away With It we are fully licenced and registered with the Environment Agency. This means we recycle 80% of everything we take and your waste is disposed of at one of our trusted Waste Management Facilities. Most companies tend to charge you for the whole skip, regardless of how much you fill it. We don’t agree with this. At Away With It you will only every pay for the space you use, whether this be in a skip or one of our manned waste removal trucks. This makes our skip hire solutions much more cost-effective for you and we can cater to most budgets, just get in touch with us to discuss. Get Your Quote for Skip Hire in Forest Gate! If you are at all confused or require some clarification, simply give our friendly team a call today. They can make everything crystal clear and talk you through both options. Skip hire in Forest Gate does not need to be complicated. Simply gives us a ring on 0208 504 7390. We are open seven days a week between 7am and 11:30pm. When you call us, we’ll arrange a time to visit that suits you. All our quotes are free and without obligation and we will always provide you with the most cost-effective solution to your needs. Get in touch now!